Occupy Venice Celebrates Occupy Anniversary This Evening - Yo! Venice! 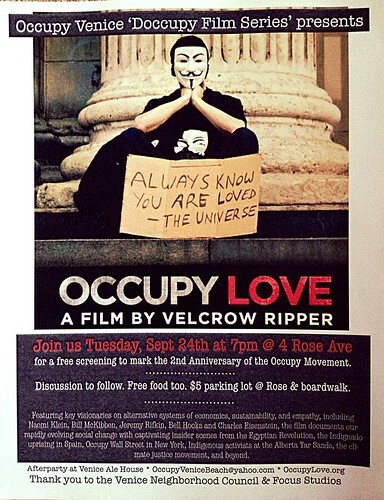 The Occupy Venice Film Series will commemorate the 2nd anniversary of the Occupy movement with a screening of “Occupy Love” from 7-10pm this evening at the Focus Studios located at 4 Rose. Discussion will be held after the screening and there will be free food provided! The after party is at the Venice Ale House next door! Parking is available for $5 at the parking lot at the end of Rose.